Description: Stack capped for transport for upgrades in Illinois but at first glance it may appear CN was throwing this unit into storage! Description: Last train of the day. Westbound grain. Losing light fast, but according to dispatch, still 3 more westbounds to come. Description: After meeting K223, K445 throttles up and passes CPLs at the south end of Ottawa siding. Description: A mixed freight, headed by CN 2298, blasts through the fog past the passenger station under construction at Belleville, Ontario. This picture was taken from the passenger bridge at the station. 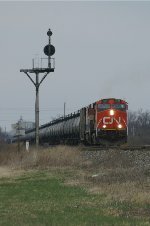 Description: CN 2298 passes the station at Belleville, Ontario on a foggy morning. The picture was taken from the newly constructed passenger bridge at the Belleville VIA station. Description: Nice clear shot of distributed power at the rear of inbound intermodal. Description: Leading a 484-axle manifest east through Bancroft, CN 2298 approaches Shiawassee Street on a gray December Friday. Description: CN through freight approaches the Main St. over pass as it traverses the west leg of the wye at the north end of the former SOO yard at Neenah, WI 13 Dec. '17. Train had three locomotives, IC 2725, CN 5691, CN 2298. The rail sections supported by concrete blocks and railroad ties, visible to the left of the locomotives, rest atop the remnants of the foundation from the ca. 1955 masonry SOO depot. It was built to replace the wooden depot built in 1891 on Sherry St., about 850 ft. to the southeast, which was torn down soon after the new one opened. The silo in the background belongs to Eggers Industries (originally Hardwood Products Corp.), 164 N. Lake St., a periodic rail customer. The woodpile background left contains remnants of old telephone poles which were removed from somewhere along the line earlier this year. The east leg of the wye is in the foreground. Description: CN through freight approaches the Main St. over pass as it traverses the west leg of the wye at the north end of the former SOO yard at Neenah, WI on 13 Dec. '17. Train had three locomotives, IC 2725, CN 5691, CN 2298. The Neenah Stove Works, currently occupied by Hafemeister Machine Corp., 635 Main St. and International Children's Fund, 619 Main St., is partially visible background left. [The facility has undergone numerous name changes in its long history, but if one were to pick a generic and historic name for it, it would need to be Neenah Stove Works because that is what it was referred to for so many years, through several changes in ownership. The second most common generic reference would be the Neenah foundry, because for many years it was the only foundry in Neenah, but obviously that could cause confusion today.] Clearwater Paper Corp., formerly Kimberly-Clark’s Lakeview mill, 249 N. Lake St., Neenah, WI (physically located in Fox Crossing, WI (formerly Town of Menasha, WI until 14 Apr. '16)), stands background right. The east leg of the wye is in the foreground.